I have been working with the theme of Joy for a number of years, and will continue to. Most of the pieces here were inspired by the idea of swirling, whirling round. They are also from the idea that we have a spark of joy inside ourselves waiting to get out, if it hasn't ignited already. The original piece, the spark of joy. I intend to make a second version of this for sale, until I do it is available to be made as a commission. Please email me for a price. 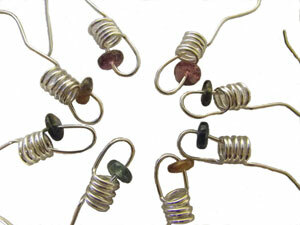 Made from 0.8mm thick recycled silver wire, with different coloured tourmaline beads. I have made these as pairs, with approximately matching beads. As the beads are natural stones the colours may not match exactly. I am happy to sell these are mis-matching pairs. 1 pair of earrings £20 plus p&p. Silver earrings made from 0.8mm silver wire. These have a textured silver disc suspended from them. Silver earrings made with 0.8 mm silver wire. Others available with three springs and traditional earring findings. 100% recycled silver hemisphere stud earrings, with 0.8 mm posts. 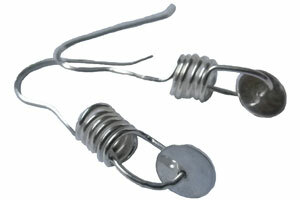 These come in two sizes, small, with a diameter of 9mm and large with a diameter of 14mm. 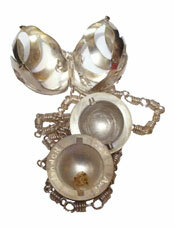 100% recycled silver, with hemispheres with a diameter of 15mm. Standard ear fittings. I am exploring how I make these earrings, and so the next lot I make is likely to be different again. Last ones of this version of hemisphere drop earrings. 100% recycled silver. Hemisphere is 14mm in diameter. 100% reycled silver ring with 2mm by 4mm wire band. Hemisphere is 20mm diameter of 0.8 mm sheet silver. Either with gold leaf in or plain. 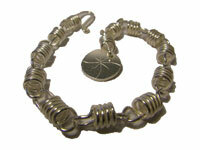 Made with 1mm recycled silver wire. The bracelets are approximately 8 inches long, but do vary due to the hand made nature of them. They have a silver disc charm which is engraved. Single spring pendant made with 2mm recycled silver wire. Comes with a silver chain.